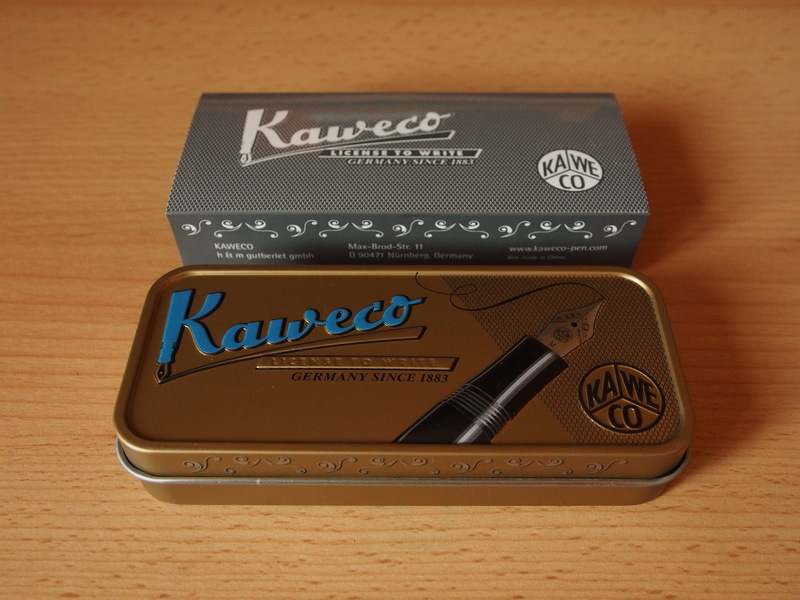 The pen was provided with a separate tin box and cardboard sleeve. 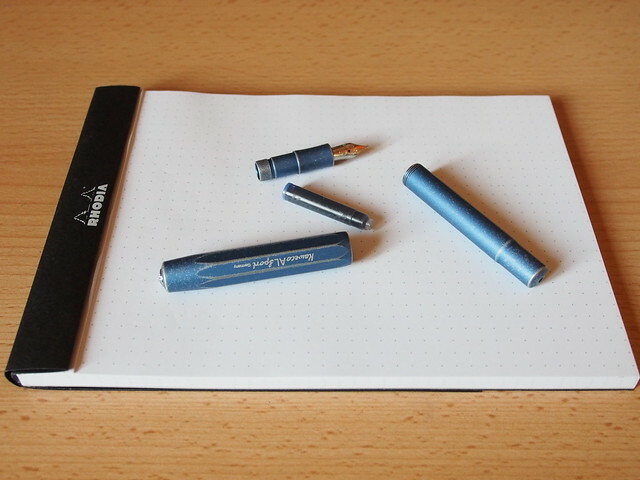 As I mentioned in the last fountain pen review I prefer minimal packing, especially when it can be reused, as in this case. The faux-velvet plastic insert is present again, although I doubt even the scratchiest plastic could harm the finish on this pen. The design of the Sport series is unique, and definitely not the “classic” style. Rather than sleek, it’s chunky. 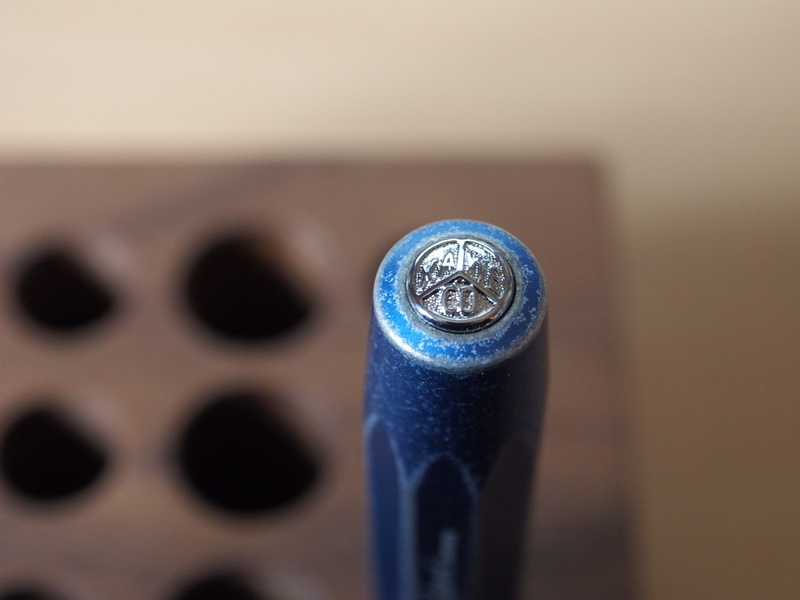 The oversized octagonal cap screws securely on the barrel, but there is a substantial overlap. This is all fine though and the overall effect is very pocketable. The finish is also unusual – deliberately going for a distressed effect. The “stonewashed” term is highly appropriate, and I can imagine that with time the more chips, nicks and dents it picks up to more character the pen will acquire. The Kaweco logo is present on the finial on the cap, along with name and country of origin on the side of the cap. The cap is push fit when posted, however the matte finish and overlap means this is very secure. 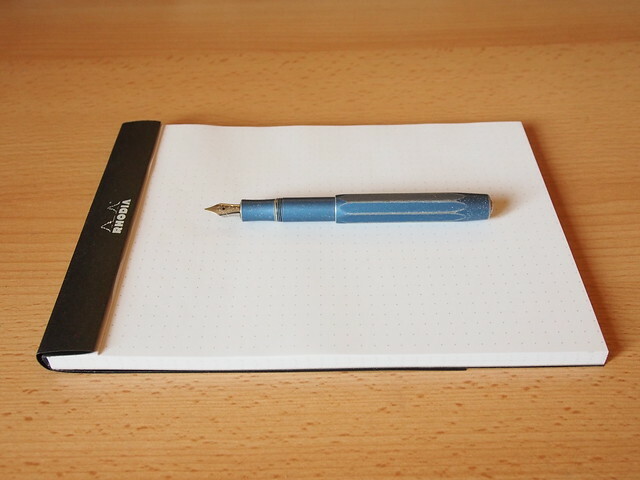 Once posted the pen is a comfortable length and is well-balanced. 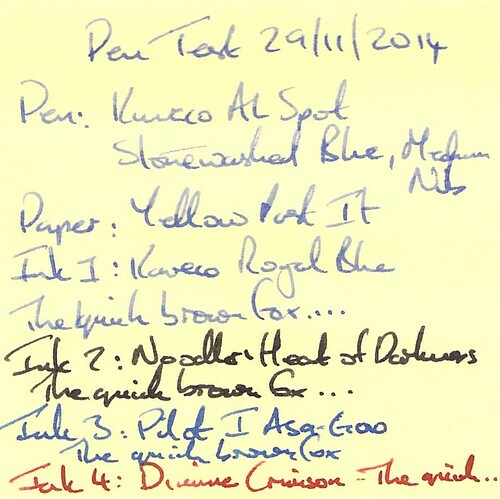 Unposted, the pen is just long enough for me, but I much prefer it posted. 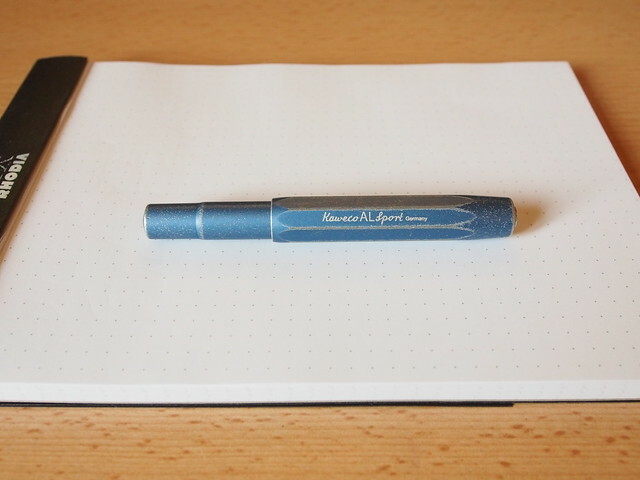 This is another metal pen which feels light in the hand. The pen was provided with a short international blue cartridge. There is no room for a second cartridge. The pen was not supplied with a cartridge convertor but one is available – unfortunately it’s only a squeeze convertor. 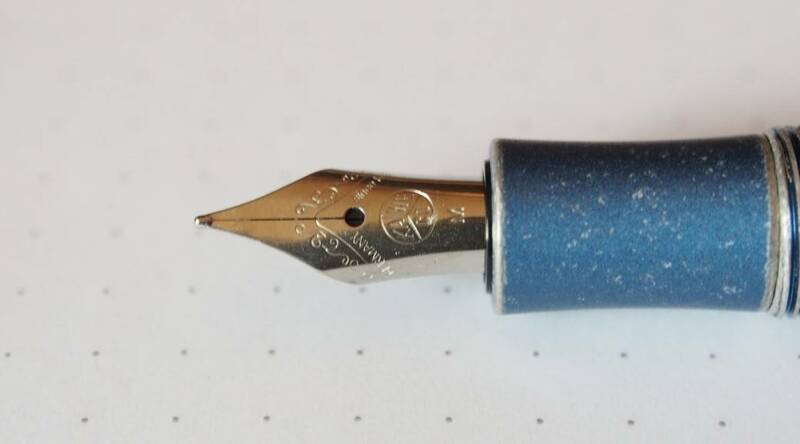 I already have one so I could try my EDC inks. There’s also an optional pocket clip, which I didn’t think to ask for. 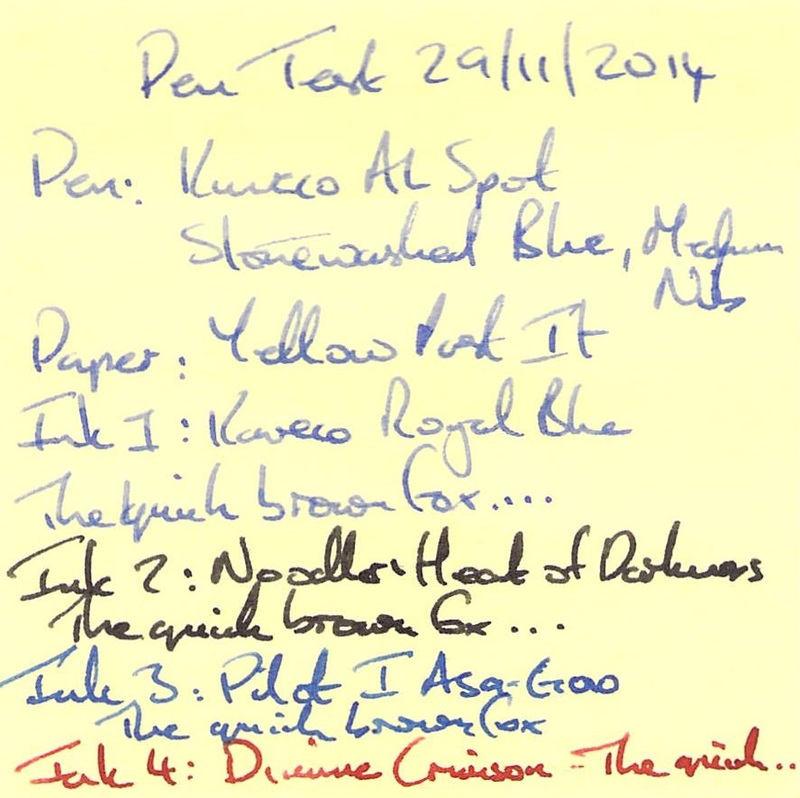 As this is a blue pen, I would normally use a blue ink and the equivalent of a European fine nib. In this case I asked for a medium nib to try out as a comparison with other nibs from Kaweco. Despite being a small nib, it looks in proportion to the rest of the AL Sport. The grip section is comfortable and the matte finish helps. The threads were not sharp and did not detract from the grip. 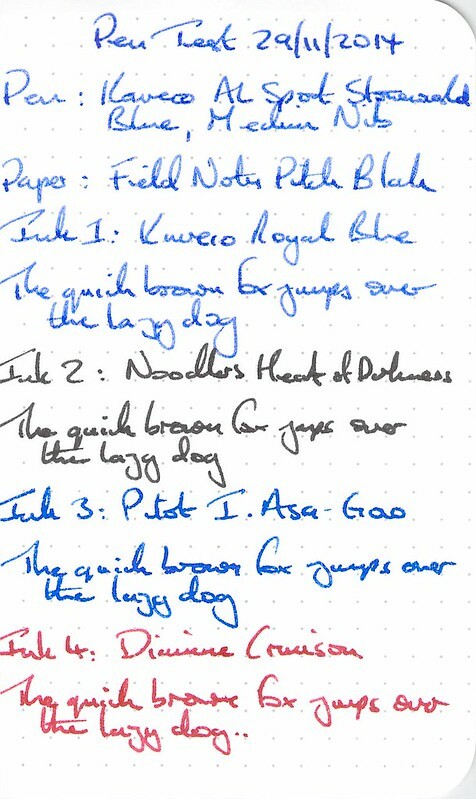 For the writing tests I tried a Kaweco Royal Blue cartridge, along with my three current EDC inks (Noodler’s Heart of Darkness, Pilot Iroshizuku Asa Gao and Diamine Crimson). 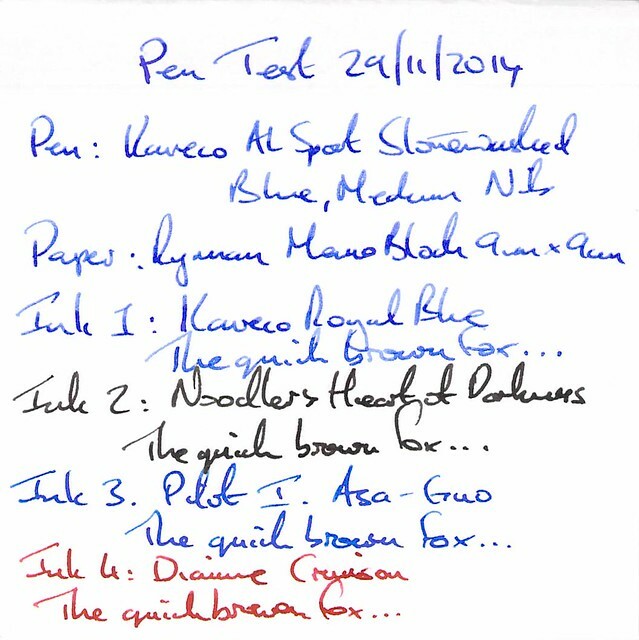 I found the flow from the Kaweco cartridge to be a little restricted, although it had been in the pen for a couple of weeks before I actually carried out the writing tests. 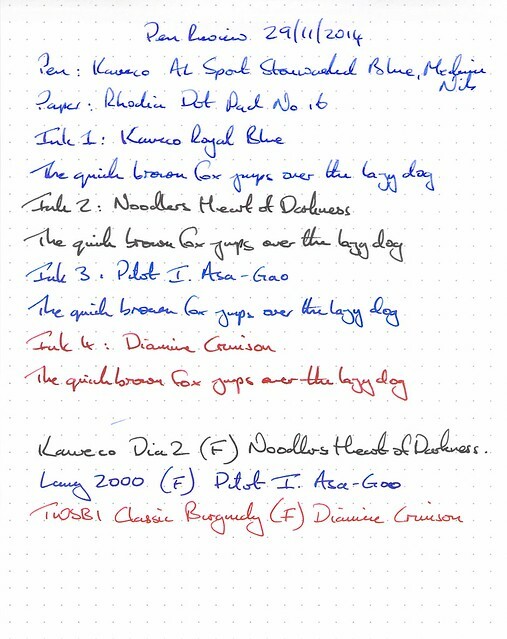 The EDC inks flowed well and the nib was very smooth in all cases (even when using the cartridge). The medium nib showed shading with Asa Gao and Diamine Crimson which doesn’t normally show with finer nibs. 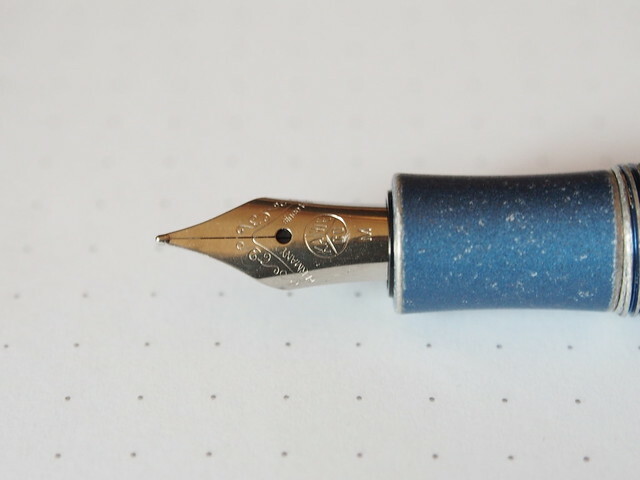 The pen was easy to clean. 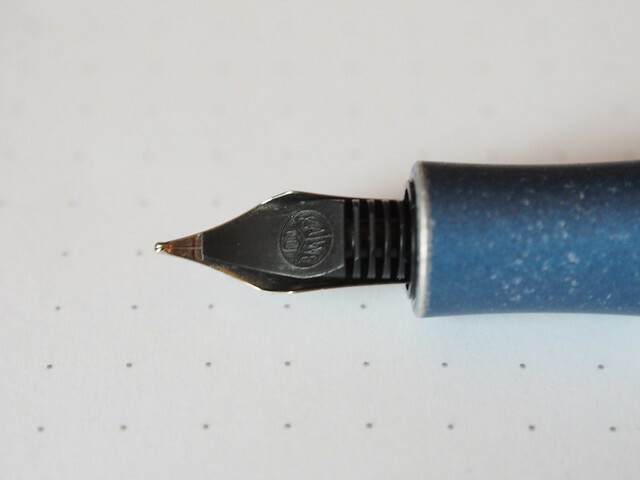 The nib unit unscrews (so is easy to flush) and can be dismantled if necessary. 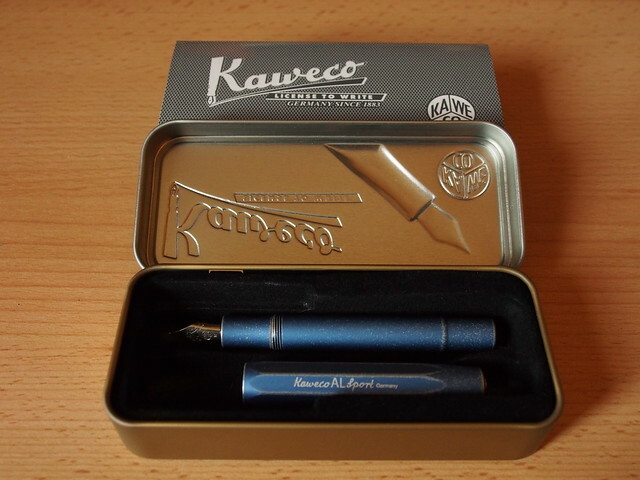 Another unusual but highly functional pen from Kaweco. I would like to have tried it with a clip, but it’s size means its highly pocketable if you don’t need (or want) to use a clip. Despite this, it still works as an everyday desk pen, but probably better posted for extended writing sessions (which is fine for me). What are my favourite features? The pocketable size, quirky finish and secure posting (without the need to screw on the cap). Is there anything I don’t particularly like? I’m not a fan of squeeze convertors, but that’s about it. If I had paid for the pen, would I regret it? Absolutely not. Now that I’ve tried it, would I buy one? Yes, but I may want to try a different finish or material (e.g. acrylic). There’s a lot of choice in the Sport range, and it seems almost churlish not to give some of the other options a try.